Agricultural machinery is equipped with numerous tools these days! When it comes to precision agriculture, do you know how to use these tools to the best of their ability for your operation? 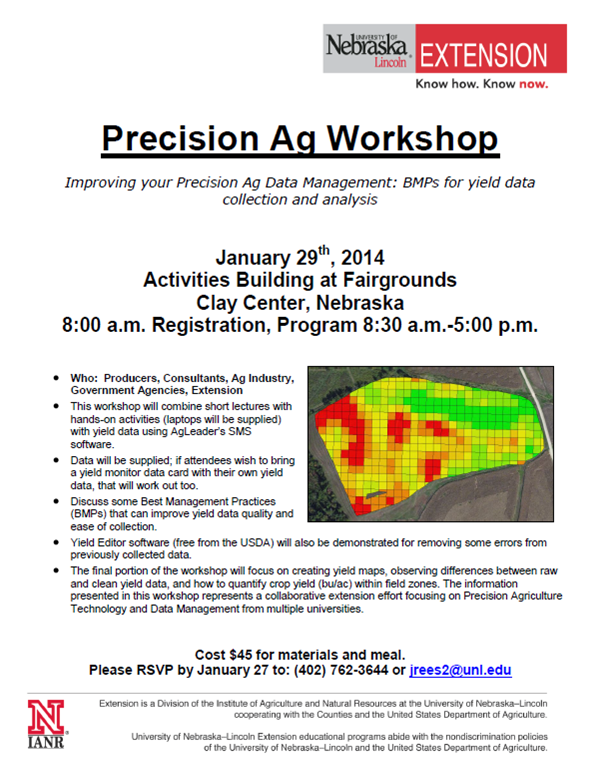 We’re hosting Precision Ag Workshops in Clay Center and York on January 29th and 30th respectively to help anyone interested learn how to utilize these tools more effectively. Computers, software, and data will be provided, but you are welcome to bring your own yield monitor data card to work on if you wish. Please register for Jan 29th session to Clay County Extension at 402-762-3644 or jrees2@unl.edu or for the January 30th session to York Extension at 402-362-5508 or gary.zoubek@unl.edu. Great opportunity for women in agriculture interested in learning more about risk management! Brandy VanDeWalle, Extension Educator in Fillmore County is hosting this series of workshops. Soon 2012 will be in the books and with the New Year approaching, what a better time to set resolutions for your business! Developing management and decision-making skills for farms and ranches is becoming more important than ever before. Today’s volatile agricultural markets can increase your risk if not managed properly. The University of Nebraska-Lincoln Extension is offering a program to address these issues. Annie’s Project is a six-week course designed especially for farm women to help them develop their management and decision-making skills for their farms. Sessions include brief presentations, discussions focused on the participant’s questions, and computer training to use spreadsheets. Annie’s Project gives farm women the opportunity to learn from agricultural professionals and network with other women in similar situations.